Zoysia grass is one of the greenest types of grass and is known for its stunning color. This is an excellent grass sod choice for our residential customers that want a luxurious look for their lawn. If you are looking to come home to a beautiful green lawn, you may want to consider Zoysia grass. This is a thick, tough grass that can stand up to traffic if you need it to. There are a few different types and they all have some pros and cons. Our experts will help you find out what is right for you, then get the highest quality grass for you direct from our partner sod farms. 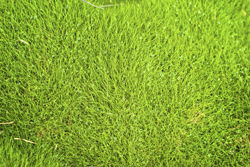 This is a grass that is perfect for lawns, but is also frequently used on golf courses. It definitely likes the hot weather around here and is reasonably shade tolerant. We are ready to help you with your new lawn, so get in contact with our helpful staff today. Four common types of Zoysia grass are emerald, Meyer, Ja’mur, and Zeon. They are all very attractive, but have different strengths. Emerald is better with shade, but not as cold resistant, while Meyer is better with the cold, but does not like the shade. It is important to note that Zoysia will turn a brownish yellow in the winter, but this is not a problem in this area, and this is one of the first grasses to turn green in the spring. We get only the highest quality grass from Zoysia farms, and can make your lawn looks fantastic all year round. 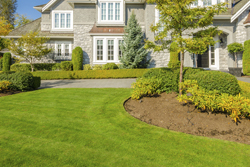 If you have been looking for that perfect finishing touch to your home, call us right away to learn about our Zoysia grass options. We have been providing high quality grass sod for 16 years now. We have gathered experience over those years working with landscapers and nurseries, and are ready to put that to work for you at your home or office. When you get your Zoysia grass from us, you know you are getting the highest quality straight from the best sod farms. Schedule us to come out and give you a free estimate to find out just how easy it can be to get your lawn looking great. Choose us to provide your Zoysia grass, and you will be getting the best price and quality. We are registered with the Georgia Department of Agriculture, but we find our word of mouth referrals to be more important than that. We strive to make sure you are satisfied with your new lawn, because happy clients tell their friends about us. Are you ready for that beautiful, lush green lawn that you have always dreamed of? Get our experienced professionals to deliver high quality Zoysia grass direct from a sod farm for you today. We deliver Zoysia grass in in Atlanta, Roswell, Alpharetta, Woodstock, Sandy Springs, Marietta and all nearby areas in Georgia.